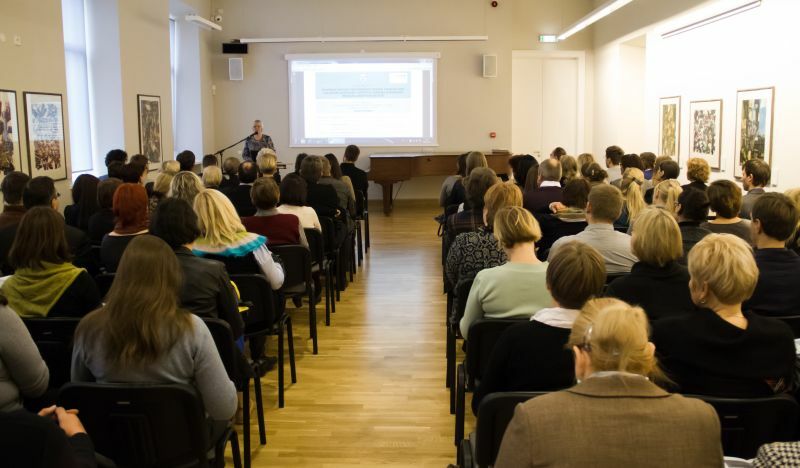 On November 19th National AthenaPlus and Lithuanian Council for Culture Conference “The Reuse of Digital Cultural Heritage for the Development of Tourism in Lithuania and Increasing Museum Attendance” was held in Vytautas Kasiulis Art Museum in Vilnius. It was organized by the Lithuanian Art Museum’s (LAM) department, Lithuanian Museums’ Centre for Information, Digitisation and LIMIS (LM CID LIMIS). During the conference (photo by T. Kapočius). Promotion of the AthenaPlus project, raising interest in new tools being created and tested during its implementation was very important part of the conference. As a result, participants were introduced with activities of the AthenaPlus, its first results and new tools being tested. The main focus was put on MOVIO tool for staging virtual online exhibitions. LAM’s pilot exhibition “Architecture and Visual Arts at the Old University of Vilnius” served as an example of MOVIO functionalities. Last but not least, participants were invited to become involved in AthenaPlus activities, especially in the testing or providing professional feedback for further development of new tools. During the event several institutions already had expressed their interest in such involvement.